All the events, then, of Christ's crucifixion, of His burial, of His resurrection the third day, of His ascension into heaven, of His sitting down at the right hand of the Father, were so ordered, that the life which the Christian leads here might be modeled upon them, not merely in a mystical sense, but in reality. For in reference to His crucifixion it is said: "They that are Christ's have crucified the flesh, with the affections and lusts" (Gal. 5:24). And in reference to His burial: "We are buried with Him by baptism into death" (Rom. 6:4). In reference to His resurrection: "That, like as Christ was raised up from the dead by the glory of the Father, even so we also should walk in newness of life" (Rom. 6:5). And in reference to His ascension into heaven and sitting down at the right hand of the Father: "If ye then be risen with Christ, seek those things which are above, where Christ sitteth on the right hand of God. Set your affection on things above, not on things on the earth. For ye are dead, and your live is hid with Christ in God" (Col. 3:1-3). 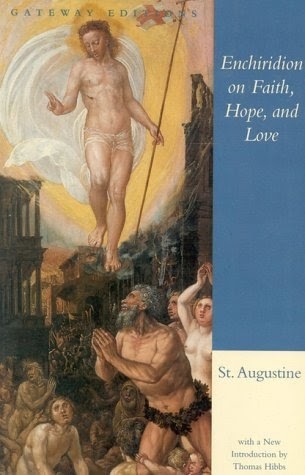 - St. Augustine, Enchiridion on Faith, Hope, and Love, LIII.